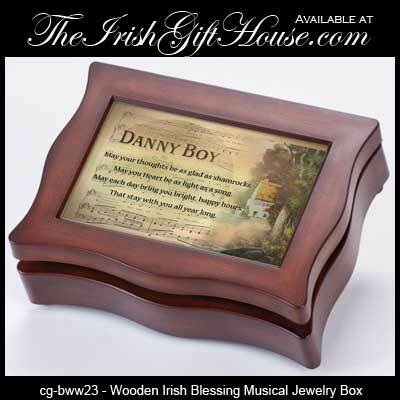 This musical Irish jewelry box plays Danny Boy and it is enhanced with a blessing. Sorry, this musical Irish box is now sold out, but we will have new designs shortly. May your thoughts be as glad as shamrocks. This musical Irish jewelry box features a digital player that plays Danny Boy and the lid is enhanced with a blessing that may be replace with your own 4" x 6" photo. The Irish jewelry box is enhanced with a hinged lid along with a footed base; the wooden box measures 6” x 8” x 2 3/4” tall. This Irish music box is gift boxed, complements of The Irish Gift House.